Over the last four years during the Cornell School District Annual Thanksgiving Dinner Drive, students and teachers have collected thousands of pounds of nonperishable items and grocery store gift cards to benefit the Coraopolis Community Food Pantry. This year with the help of the KDKA Turkey Fund, the Greater Pittsburgh Food Bank and St. Andrew's Church of Moon Township, the Cornell School District’s Annual Thanksgiving Dinner Drive will provide over 100 Turkey Dinners to benefit families in the Coraopolis community. Members of the Cornell Elementary School Parent Teacher Committee, Cornell High School Honor Society, Cornell School District administrators and teachers and members of St. Andrew’s Church sorted and packed the donated Thanksgiving dinner side dish ingredients, including mashed potatoes, vegetables, biscuits and more, for distribution during Thanksgiving to members of the food pantry. In addition to the side dishes each family received a gift card for the purchase of a Thanksgiving turkey from a local grocery store. The mission of the Coraopolis Community Development Foundation is to serve the community of Coraopolis PA, encouraging and assisting in renewal through community service and development projects, providing relief, resources and redevelopment. The Community Food Pantry is located at 1000 5th Ave. in Coraopolis and holds scheduled pantry services on the first and third Sunday of every month at 3PM. The food pantry serves 65-85 families throughout the year and over 100 families during the holiday season in the 15108 and 15046 zip codes. Give Big Pittsburgh raises money for local nonprofits through a single online donation platform, providing a simple way to connect donors to the charitable causes they care about most and encourage them to take action. This 24-hour online fundraising effort hosted by the Pittsburgh Magazine in conjunction with the Pittsburgh Foundation and local sponsors, offers nonprofits in our area the chance to raise funds to support their critical missions. Please give to the CCDF on November 28th so that we can continue providing service to those in need our local community! You can help the CCDF when you do your Holiday Shopping on Amazon! Shop for everyone on your list this holiday at smile.amazon.com/ch/20-5398661 and Amazon donates to the Coraopolis Community Development Foundation. Easy as that! Please share with friends and family. Salvation Army Volunteer Bell Ringers Needed! Share the Warmth! Donations accepted through Nov 17th. We have a basement full of hearty Canna Lily bulbs, and they need a home! For a $5 donation to the CCDF, you can take one of these organically-grown bulbs home today! For more information, or to purchase a bulb, either private message Coraopolis Community Development on Facebook, or email Amy Cavicchia at amy.cavicchia@coryfoundation.org. All proceeds go directly to benefit the programs of the CCDF. The “Adopt a Plot” project is designed to bring our neighbors into their community garden. It will teach children that with a seed, you can feed those in need in our community. Starting in May, 5 groups will garden a plot of land to plant, grow, water, maintain, and harvest, fruits, vegetables and herbs. 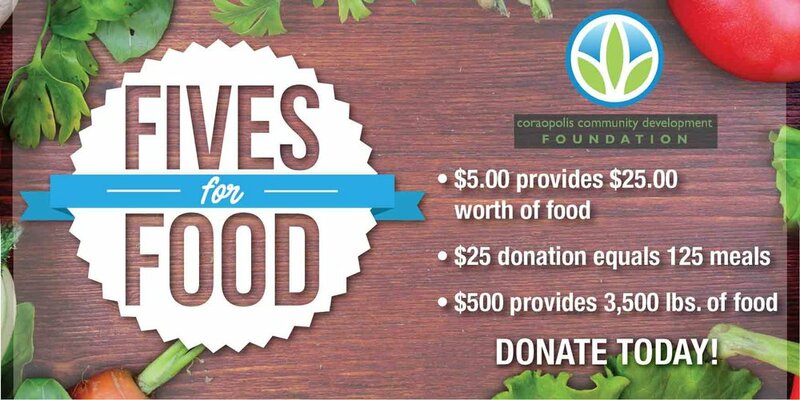 The majority of the harvest will go to the CCDF’s food pantry, located at 1000 5th avenue in Coraopolis.